…it’s because I’m typing it on my iPhone. I do everything on my iPhone these days. If there was a job where you could get paid for buggering about on an iPhone I’d be filling in the application form right now – provided of course that I could fill it in on my iPhone. I’m also on the toilet. This, my friends, is the future. Some boffins have managed to simulate half a virtual mouse brain on a supercomputer. Isn’t that just typical of boffins? Give them an easy job and they all run around with biros behind their ears throwing supercomputers at it willy-nilly! And even then they only half solve it! Talk about using a sledgehammer to crush half a nut. There, that wasn’t hard, was it? It is with regret and great sadness that blogrot announces the withdrawal of AOS (Any Old Shite), its revolutionary new information service for the 21st century and beyond. Can it really be mere coincidence that just one day after the launch of AOS, His Lord Sir Professor Tim Berners-Lee, inventor of computers and the internet, chose to warn of the dangers of misinformation spreading via blogs?? There is a great danger that [the internet] becomes a place where untruths start to spread more than truths. Well duh! That’s the whole point, Tim! For that glorious 24 hours they were like putty in my hand! Here’s how it works, OK: you get your knighthood, then you keep your nose out of other people’s business and give the rest of us a fair crack of the whip. This is people’s livelihoods you’re playing with here. AOS orders dried up literally over night. AOS: blogrot launches revolutionary new information service! Does the Salford Quays millennium bridge open/tilt to let boats through? If so, when? AQA: The Gateshead Millennium Bridge Tilt times are at 11.05am,12.30pm and 5.00pm today, but the times change. You can contact 01914775380 for details. Readers unfamiliar with the geography of the United Kingdom may wish to consult the following helpful diagram before continuing. One pound. A quid. 100 pence. No kidding. Simple text your question to 74483 (that’s SHITE on your phone keypad) and for just 90p we’ll respond within the next couple of hours with whatever takes our fancy. That’s a whopping 10% saving on our closest rivals, AQA. – So, how much is that then? – Ten and seven Euros plus four score and ten and another seven, sir. – You mean… seventeen Euros ninety-seven? – That’s right, sir: ten and seven Euros plus four score and ten and another seven. What the hell is that all about? They might as well be using binary. It’s no wonder they can’t handle advanced counting systems such as quarts, ounces and furlongs. It is for this precise reason that we never let them into the Commonwealth and they’ve hated us for it ever since. Famous Frenchman Zinedine Zidane, seen here playing in the “Number Two Threes Plus Two Plus the Square Root of Four” shirt. Item removed from bagging area: please replace the item or press Cancel Item. A conversation with a robot this morning. I don’t think we need to worry about them taking over the world until they can at least expect us to buy a loaf of bread in Sainsburys. I’ll give them this though, they appear to have a highly developed sense of irony. SCIENCE SPECIAL: Cloaking device possible!!! Well, not really. But they can make a speck of dust feel a bit queasy which, we’re assured, is the same thing in principle. Data-centric gadget-crazy long-distance business traveller? Then worry no more: all your prayers have just been answered! When your plane goes down over the Pacific, you’ll be the first to be found, floating pocket-upwards, thanks to the bloody ludicrous Inflating Flashbag! Next week: Creative puts Zen Planeto into orbit around Mars. Barmy French couple cremated after big thaw in home-made cryogenic chamber. He once told reporters that ideally he would like to open his wife’s freezer every day and tell her “Hello, I’m so glad to see you”, but that it was better it stayed shut. He said he opened it to check it every five years. Given the particulars of this tragic case, anyone thinking of building their own cryogenic facility might want to consider that John Lewis offers excellent service packages on all white goods, in most cases extendable to 5 years. Duality: how it’s fascinated the great creative souls of our generation. From Status Quo’s Dog Of Two Head to the Spice Girls’ Two Become One, our great thinkers have… erm… sorry, I’ve lost my thread a bit. Oh yeah, that was it. Conclusive proof that the Japanese are all barmy finally comes in the shape of the two-cursored mouse. One mouse: two cursors. No idea how it works. Mad as a box of frogs, the lot of them. HELLO? I’M ON THE MOUSE! Sony has announced the ultimate gizmo for 2006: a mouse with a phone built into it. 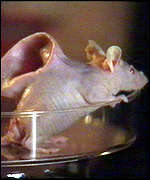 I’m even more excited than I was when the boffins announced that mouse with an ear built into it a few years ago. Similar idea, of course, except Sony’s comes in three different colours. It got me thinking about other hybrid devices we might all benefit from. A keyboard that also makes coffee, tea and other hot drinks. Simply type “L-A-T-T-E”, “E-A-R-L-G-R-E-Y” or “N-I-C-E-C-U-P-O-F-H-O-R-L-I-C-K-S” and the drink of your choice comes dribbling out the side and forms in a puddle on the desk. Logitech will produce one with special “One Sugar” and “Two Sugar” buttons for dummies. Real men will use F2 and Ctrl+F5 respectively. An in-car navigation system that will guide you to the nearest cinema showing a romantic comedy starring Meg Ryan. There’ll be big bucks in tie-in deals with the major studios, you mark my words. Hit titles will include When Harry Successfully Navigated His Way To Sally and Sleepless in 47°36’0″ N, 122°19’0″ W.
Put simply, it’s a photocopier with a camera built in. The ultimate accessory in non-portable photography, the Cameracopier will enable people to take pictures of small grey rooms with hitherto unimagined ease. It won’t be long until the Finns break ahead of the pack with a copier bearing two cameras, or even three. The sky’s the limit. In a perverse echo of the Wilkinson Sword/Gillette Blade Race of the 1990s, progress won’t be halted until we have a copier that’s completely encrusted with tiny cameras, like some giant fly’s eye. Flickr will spin off a whole separate site for pictures of grey rooms. It’s the future. It’s, like, boots, but with jets. I’m surprised nobody’s thought of this stuff before. I’m on a roll. An infinitesimally cute white MP3 player that can perform an emergency face transplant. The competitors, with their silly obsessions with this many hours of video, or that many gigabytes of “songs”, will stand back and gasp as the FacePod leaps into action after a savage dog attack, repairing delicate nerve endings and popping your eyes back in. Your friends will be slack-jawed with amazement. You’ll just be slack-jawed. Trevor Bayliss, eat your heart out. A team at the Massachusetts Institute of Technology has prototyped a $100 Laptop. The laptop takes a number of routes to reduce the laptop’s costs, including replacing the hard disk with iPod-style flash memory, a smaller screen, and best of all, a big yellow crank handle reminiscent of Trevor Baylis’s clockwork radio. The aim is to provide every child with a laptop by 2015. Life imitates Onion. It’s uncanny: the Onion got it spot on, right down to the second lubra-strip. It makes you wonder where Gillette’s R&D department are getting their ideas from. Mathematically-minded (or bored) observers will have noticed that, in leapfrogging the 4-blade solution, Gillette has established an interesting protocol: only producing razors with a prime number of blades. Next comes the 7-bladed razor, then 11, then finally the one we’ve all been waiting for: a square-headed, quadra-lubra-stripped, 13-bladed behemoth, powered by a car battery and aptly named the “Gillette Unlucky For Some”.